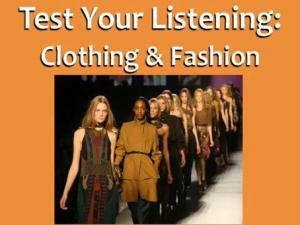 Listen to descriptions of clothes in a fashion show. Look at the pictures of the different models taking part and then click on the correct picture of the model that is being described. Hats are very popular and there are many different kinds of hats and words to describe them. If you like hats and would like more vocabulary to talk about hats, listen to this slow dialogue, then the teacher will help you to understand what kinds of hats they're talking about. Long sleeve, short sleeve, collar size... These are things Eddie is considering as he's buying some new shirts. Listen to the slow and fast dialogue of the podcast while following along with the transcript. This podcast includes explanations of highlighted words to help you expand your vocabulary, especially regarding slang terms or everyday phrases. Not all brand name products sold in the markets are real; some are fake. Are those real Nike tennis shoes for only $2? This is a dialogue which contains excellent vocabulary typically used for talking about fake or real products. Essential language is explained by a teacher. What do people wear in the Spring, Summer, Winter and Fall? Clothing styles are always changing. Listen to this conversation about appropriate clothing to learn and review vocabulary. To see the full transcript and vocabulary notes, click "Quick Script" at the top of the page. Learn to talk about trends and fashion in English. In this intermediate English lesson you will hear two friends talking about clothes. One of the women is very fashionable and the other is asking for advice. 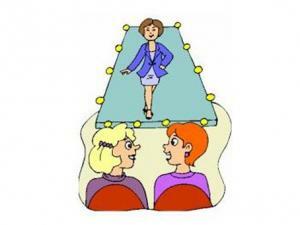 You will learn the most common vocabulary for talking about the trends in clothes and shoes. Melissa talks about what influences what she wears. Includes audio file of native English conversation with transcript of all audio and vocabulary notes. Some words in the transcript are "clickable" and take you directly to the notes. Great for expanding your vocabulary and enhancing pronunciation! 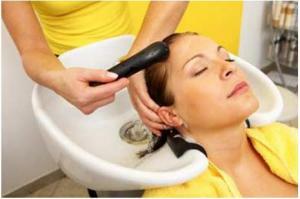 Jess talks about hairstyling, manicures, and other beauty procedures women go through. Includes audio file of native English conversation with transcript of all audio and vocabulary notes. Some words in the transcript are "clickable" and take you directly to the notes. Great for expanding your vocabulary and enhancing pronunciation! 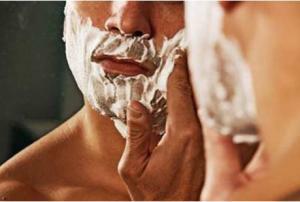 Tom talks a little about what men are willing to do and pay to look good. Includes audio file of native English conversation with transcript of all audio and vocabulary notes. Some words in the transcript are "clickable" and take you directly to the notes. Great for expanding your vocabulary and enhancing pronunciation! The Fashion industry is big business. But what is it like to work for a fashion company, or a fashion 'house'? 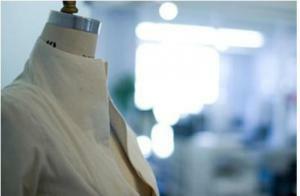 What kind of people work in the fashion industry? What kind of clothes do you think they wear? Do you think you would like working there? Click PLAY on the iPod and listen to the recording. Decide if the statements below are true or false, then check your answers to see how well you did. You can also look at the Script of the recording to check the spelling of words you are unsure of. 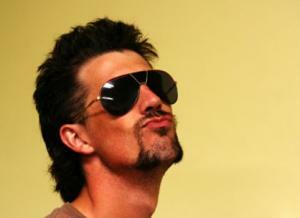 Jeff talks about all the types of facial hair he has had over the years. Includes audio file of native English (U.S. / Canada) conversation with transcript and vocabulary notes. 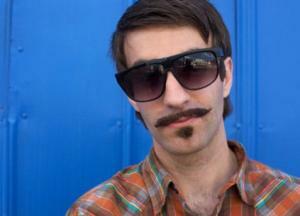 Jeff talks about growing a mustache and a way to help fight cancer in the month of November. Includes audio file of native English (U.S. / Canada) conversation with transcript and vocabulary notes. 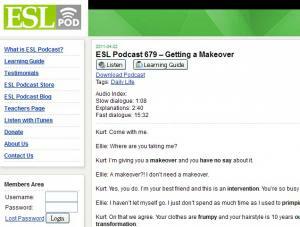 Kurt wants to change his friend's style completely. Surprise or scary? Listen! It includes downloadable audio file with slow dialogue, explanations and fast dialogue. Dialogue is short and focuses on slang terms. Rebecca talks about how she was introduced to make-up and her thoughts on it. Includes audio file of native English (U.S. / U.K.) conversation with transcript and vocabulary notes.